How many telemarketing outbound calls can you make before you start to sink down into your chair and feel bored or tired? You use the same opening script a few times. You get some rejection, and prospects not available. You feel comfortable in your seat and your mind can drift away from what you're doing. At this point I see people start to physically and mentally move downwards. They either slouch for ward and support their head on their hand, or they sink backwards into their chair and recline. Mentally they have dropped away from being at the top of their game, in the zone, or a fully motivated state. When you're in this state, whatever term you may use to describe it, you have full access to all your resources. 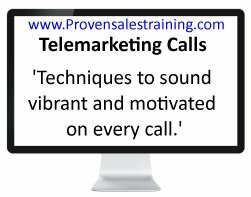 You can quickly use your skills and experience to resond to the twists and turns your telemarketing outbound calls take. But as you continue to make the calls you move further away from this heightened state and your responses and interaction with the prospects is not as good as it can be. The prospects can hear your motivational state in your voice. When you make the first call and you're fully motivated and focused on your goal of closing a telesale or achieving a sales appointment your voice is vibrant and full of energy. When the state drops you may sound bored or tired, and prospects pick this up. Often this is how we know an incoming call is from a call centre. The caller sounds like they have already made hundreds of telemarketing calls that day. Go to the www.Provensalestraining.com Home page.